From a refreshing facial or perfect pedicure to a complete mud wrap, from a salt scrub to hot stone therapy, spa offerings are many and varied. These villas offer more than a simple massage on the sun lounger (see Body and Soul) – they include dedicated spa services with trained staff and special facilities for a sensational spa treatment. Moments before we arrived at the beautiful Baan Taley Rom, we had to pause in our car to wait out a Natai Beach-style traffic jam: a herd of buffalo was being ushered across the road, destined for some luscious green grazing grounds nearby, we guessed. And so began our delightful immersion into rural Thai charm. It was well worth the wait. Once we stepped through the villa’s elegant arched entrance we found a regal yet welcoming holiday home of contemporary style that offered a fine balance to the dazzling sea and sky views beyond. 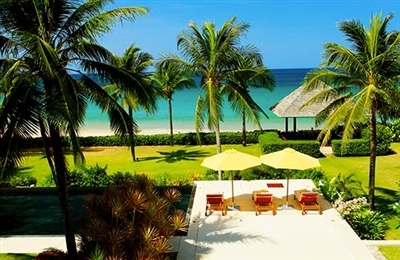 Sitting in splendid isolation on an acre of absolute beachfront land, Baan Taley Rom is a rare find in the Phuket area. With so much space to work with, the villa has an exceptional range of facilities: a glittering 25-metre pool, a fully equipped gym, a spa room, wide sundecks and landscaped gardens for outdoor play. Though the villa facilities alone offered plenty to keep us occupied, having a friendly team of staff on hand ensured that we were never left wanting. Gathering for a family-style Thai meal prepared by the villa chef while watching the tropical sunset paint the sea and sky a rosy-golden glow is an experience we will not soon forget. 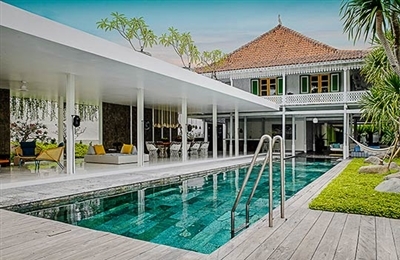 Our stay at Villa The Beji was delightful. The villa is incredibly well laid out, especially for families – it would make a smashing venue for two or three families to share. All six bedrooms are fabulously spacious and have extravagant bathrooms, and the living areas are all strategically positioned for parents to keep a watchful eye on children. 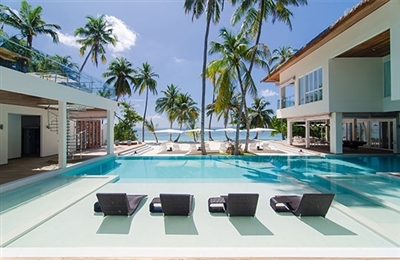 There’s a huge amount to do at the villa itself – swimming pool, home theatre room, table tennis and gym, as well as a tennis and basketball court and a mini football pitch (the latter shared with the adjacent sister villa). If that’s not enough, nearby is the beach and the Finns Recreation Club, which provides first class recreational and leisure facilities. 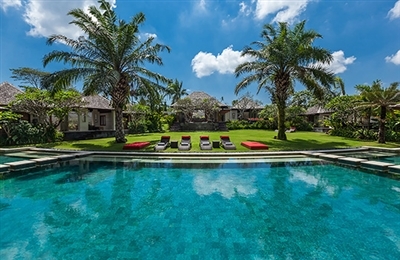 Guests of Villa The Beji enjoys complimentary access to the exclusive Finns Recreation Club Guests for up to 6 guests daily. The Beji’s staff were a real pleasure and made our stay very easy – the chef produced great food, the waiters and waitresses were discreetly attentive and the villa manager very keen to assist. They made the villa particularly hard to leave when it was time to head home! What the owners have done with the space at Villa Amy is incredible; so much has been fitted into the villa without overcrowding it. We don’t think we have ever before encountered such a large master bedroom, complete with huge hardwood beams stretching all the way to the lofty ceiling, polished floors, antiques, sitting areas and sliding glass doors leading out to a fish pond which appears to cascade into the swimming pool below. We felt a bit spoiled to be honest. An even greater feeling of space is conveyed by the clever use of wooden louvre shutters in the garden walls: lying beside the pool looking at views of the green swaying rice while cooling breezes drift through the shutters was pure bliss. Speaking of the pool, its low position means that when swimming or sun bathing you can’t help but look up and be mightily impressed by the architecture of the master bedroom. A beautiful place to simply chill! There have been a few changes since we stayed at Villa Radha two and a half years ago, with the addition of two new villas to the enclave, a children’s playground, a gym and a spa. 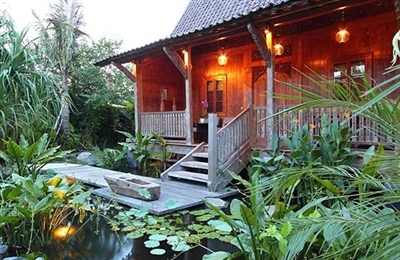 Staying at Villa Radha now means you have the choice of two spas on your doorstep. We decided, however, that we preferred the bygone era ambiance of the totally private wooden spa building within Villa Radha’s magical garden. Like the villa itself, the spa is another antique building so it is more in keeping with the overall character and charm. We noticed that with a total of five villas on the estate there is a now a little bit of hustle and bustle (and dare we say modernity) outside of Radha’s garden walls, but tucked away in our own private paradise – the gardens have grown and are even more beautiful than we remembered – we were able to completely relax and enjoy the wonderful service of the staff, and the great food. 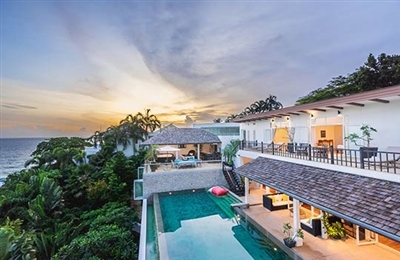 If you’re into sleek contemporary design the ethnic, rustic style of Villa Radha may not to be to your taste, but it is nevertheless immaculate and very comfortable, with all the trappings of the 21st century. There is no sitting room as such, but we enjoyed relaxing on the veranda, and were also very comfortable watching TV and movies in the air conditioned bedroom. As for the garden, well this is a landscaping triumph: forget any ideas of a modern Zen-like space, this garden will bewitch you with its tropical abundance of giant taro leaves, spiky pandanus, fan, parlour and travellers palms, bird’s nest ferns, heliconia, flowering frangipani, and rare fruit trees. It will make you wonder how it can be so full (almost to the point of being overgrown) and yet so meticulously maintained. At first we thought it was a little bit expensive for a one-bedroom villa, but when you consider the uniqueness of the property, the space, the facilities, the butler service, the pool, spa and gorgeous garden, you’ll probably agree that it’s extremely good value for money.